Astrology programs presented on this site are fundamentally different from all the programs that exist to date in 2016. What do they differ? The thing is, that an innovative approach is applied in the user interface: lists of charts (events) and astrological instruments. This approach greatly quickens and simplifies the astrologer's work process helping to avoid routine loading, selection of charts and astrological instruments. Astrology program is atomic. In other words each program focuses on a specific area of astrology, and can work both independently and in conjunction with other programs presented on this site, as they all are the astrological software package that has the name of Galaxy-Astrological Tools. 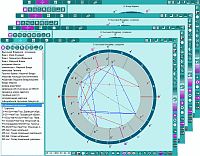 Astrological software interface is designed to work on all kinds of modern computers, from tablets to large desktop PCs. It will satisfy the needs of beginners and venerable astrologers by doing their work fast and comfortable. The main astrologer's tool allows you to create astrological charts (single, double and multi-charts) to do the analysis, rectification and prognostics of events. The program provides creating charts and their deploying in three systems of coordinates (the ecliptic, horizontal and equatorial 1st and 2nd) and fourteen houses systems. Astrological program intended to determine the geographical coordinates of settlements around the globe, and the calculation of zone time in these settlements, taking into account alternative tables and rules of the time offset. Astrological program allows you to carry out a preliminary (qualitative) rectification horoscope and thereby narrow the possible period of the querent’s birth. It is extremely important to conduct sessions with a querent, living far from the astrologer, as it prepares the test questions and automatically calculates the possible time period birth based on the answers to these questions. Astrological program allows to do basic rectification of a Horoscope and thus find possible time points of querent's birth. Rectification is based on strength (significance) of the planets, weight (significance) of astrological instruments (progressions, directions, and transits) and attributes of entered events (house theme, accuracy of an event and its weight). Rectification is done by means of a set of events from the querent's life, not based only on the theme of marriage, which improves the quality of the rectification. 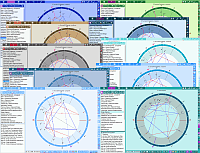 This astrological application program designed for analyzing horary charts. It allows you to assess the formal and thematic radical horary chart, perform incremental analysis horary charts and conduct a dynamic assessment of the operation of the timing horar using astrological instruments. The applied astrology program is designed to perform the initial analysis of astrological charts, and also solve a number of tasks: to identify the querent's strengths and weaknesses, to conduct a rapid analysis of the character traits and analyze horary and synastry charts, and more. Astrological program allows you to create prognosis on given astrological house themes taking into account the accurate time of birth and significance (strength) of natal chart objects. For analysis it uses not only the natal chart and transits (current celestial situation), but also such instruments for prediction as progressions, directions, and returns. Astrological program allows you to find the most favorable moments by means of astrological instruments based on the querent's natal chart and additional attributes such as working hours of the institution, direction of a newly opened business, etc. This applied astrological program allows you to solve everyday problems: to track querents' birthdays and holidays, to receive the status and strength of the planets, as well as to create mini-forecasts on the themes of the horoscope on the 28-day period. Anamnesis - Querent's visits history bank (GalaxyAnamnesis). History bank of querent's visits stores information (charts, text, graphics, video and audio) about the history of querent's visits and helps an astrologer to consult. The applied program is designed to analyze sequences of the similar events and identify patterns of dependencies of celestial situation influence on the events in question. This tool allows you to find the correlation between the position of the celestial objects and sequence of the same type events. Applied on Astrocartography astrological program with a lively and powerful mapping, which allows to find not only the locality, but also the house. It allows you to display not only the conjunction line, but also favorable area. It works with a wide range of maps and is fully integrated into the space Galaxy. Asteroids - Asteroids in Astrology (GalaxyAsteroids). Specialized astrology program is designed to work with asteroids and provides a modern astrologer with a tool for practical and research work. The specialized program to work with the stars. Not so much astrology programs that provide the opportunity to see the fixed stars in the horoscope, and there are no programs which allow you to see aspects from/to the stars, and give the description. This program is designed to fill this gap and provides a modern astrologer with a tool for practical and research work with stars as astrological objects. The specialized astrology program is designed to work with the lots (Arabic parts) and midpoints (middle points) as chart objects. It allows an astrologer to look at familiar things from a different angle. Astrological program designed to control user implementation of test tasks who study remotely. This program stores information on students work in its own database and allows to check quickly the quality of the test tasks performed by these students. Feedback with users who use multimedia units is carried out through this program. Elements, signs, houses, planets, crosses, configurations, degrees, etc. - Can be a long list alphabets used in Astrology. To understand their essence and receive qualitative (not quantitative), their interpretation and the program is designed. It is free and is designed for those who are first dipped into a bottomless world of astrology and want to understand it. Astrological program performs an extensive search of charts and events by specified criteria: from the natal chart elements (static search) to a given position of the objects of the celestial situation (dynamic search). The selection of charts by the visit date to the astrologer, by the elements of the date-time of birth (hour, date, etc. ), by place of birth, etc. All of these are often necessary to use in modern astrology practice. Multimedia Astrological Encyclopedia contains esoteric knowledge. You can not only read and see pictures in the Encyclopedia articles, but also watch video and listen to audio where it is available. The program brings together a variety of programs of software package and allows you to manage them. It is designed to familiarize users with the astrology software package named Galaxy. It gives the opportunity to see the work of all the package programs and get to know their features. Pictures with description provided from the operation programs of the package show features of each program in detail, and video clips show these features in real time mode. It allows you to manage settings of astrology programs included in Galaxy astrology software package. Settings interface is integrated in almost all Galaxy space. It aggregates the help in her different manifestations and gives advice on achievement of the goal. At input of a keyword or several words, Helper finds suitable options and paints "action plan". It allows you to synchronize data between Astrologer’s multiple computers, thereby providing ease of data exchange. It ensures the consistency of the used querents database, recovers indices and compresses data, performs backup and restores, imports and exports data from other (to other) program. Astrological program supports various astrological bases and databanks, including, and AstroDataBank on the basis of which it is possible to prepare thematic sets of cards and couple the card event for use in the research purposes. This program allows you to create both free and paid, so-called licensed modules, which are atomic file of a given subject. This file may be obtained by user via the Internet and automatically opened on a computer for viewing and learning. It is designed to keep track of versions of Galaxy space programs and release of new functionality. The advanced filtering system allows you to search for the required functionality and understand when it was released or it is intended for release only. This program allows you to update the directories of available multimedia modules and all Galaxy space programs. Galaxy - Milky Way (MW) Teaching/information environment. It contains a number of astrology software for watching and creating multimedia modules, multimedia encyclopedia and a number of other free tools. This is a free version of Galaxy. 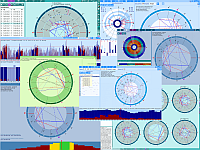 It includes all free programs presented on this page: Zero, DataFinder, Cyclopedia, PreView, PresentViewer, PreSetter, Helper, DataWorker, DataCenter, PresentMaker, Versioner, Updater and Galaxy - Integration shell. Galaxy - Astrological Tools (AT) Full working environment of a practicing Astrologer. It contains the complete set of free astrology programs included in the version of the Galaxy - Milky Way, and all paid ones presented on this page. HDD (SSD) not less 16 Gb This parameter is relevant for tablets.